Hiking can be exciting and fun, but it can be uncomfortable if you are not wearing the right shoes. Most hikers veer towards hiking boots for their outdoor treks. However, during the high summers, hiking boots can be restrictive. A great alternative for hiking boots is a pair of hiking sandals. They let your feet to breath and they are also lightweight. 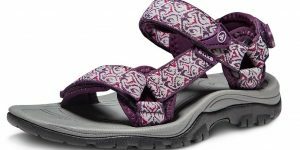 Having said that, we have done some research and come up with the top 10 best Hiking Sandals for Women for you. Type of Hiking: You must consider whether the sandals are ideal for the hiking you are organizing to go for. Open sandals are perfect for just going around the easy trails, flat or campsite. If you are carrying a heavy pack, it’s not advisable to buy sandals as they do not offer great cushioning and support that a good shoe will give you. Toe protection: Whenever you are planning to go for a hike, you need to find a pair that will have some toe protection depending on where you are going for a hike. Many trails have roots, rocks, sticks and other objects that can injure your toes or foot. You need to get a good sandal that has toe protection. Fit: The fit is also another essential factor to look when you buying any footwear. You need a comfortable sandal that comes with adjustable straps that can be adjusted to fit your feet. 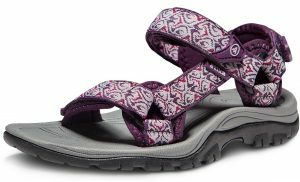 Anytime you are talking about the best Outdoor sandals for women, you have to talk about ATIKA products. Their construction makes them very comfortable and lightweight thus best for hiking, walking, running and more. On the other hand, they have a high-quality sole that improves traction and grip on all surfaces. The shoes also have adjustable shock padding with straps that make your feet comfortable. This support sandal comes in different sizes thus you can select the one that will fit you perfectly. In addition to that, it has a contoured foot-bed fitting and they are easy to wear on/off. This model of Xero sandals has several brilliant features that make it a popular choice. They are 76 percent thinner and lighter compared to other sports sandals offering comfort and protection that you require. Most importantly, the sandals are ideal for Crossfit, jogging, running, walking, hike or even running ultra-marathons. Ideally, the shoes are 10mm thick and are flexible enough to fit in your bag. This shoes dries Fast and are water resistant. They are also lightweight and easy to wear. For that reason, you will comfortably walk with these shoes for a long time and you will never get tired. The Northside is one of the decent sandals on our list. It is a popular choice among adventurers and hikers as it has a great design and reasonably priced price. The Sandal is solid and built to withstand any kind of weather that you will find on outdoors. Besides that, the sole is made of rubber which gives firm grip irrespective the kind of surface you are walking on. What makes this kind of sandals stand out is their feminine and well-designed nature. Crafted by hand utilizing high-quality materials providing toe all-day comfort and superior heel. 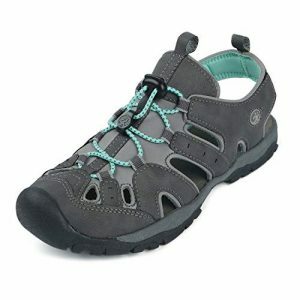 Besides that, Viakix Walking has been crafted with durable webbing thus it will deliver long-lasting support and wear. Whether at any outdoor, hiking, kayaking, beach or sports adventure. This fashionable shoe has stylish colors that offer you a perfect look. Together with that, with its ergonomic out-sole will assist you to remain comfortable even after long walks or hikes. The design is resistant, sturdy and they are intended to have great durability. 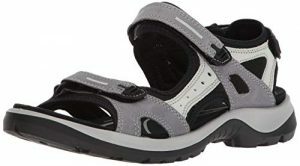 This trekking sandal sits more on the side of a track runner shoe. Made with an open framework for it to be lightweight thus you will never feel tired when wearing them. 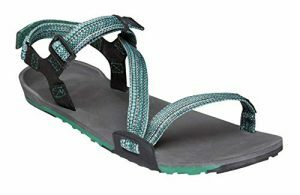 Whenever you like to fly fish, stand up paddle board, raft or doing work out, this Sports Sandal is ideal and will give you much comfort. Aside from that, they are water resistant and dries fast. Another great features it that the shoes have Great traction and grip, Zero-drop non-elevated heel and Z-style webbing that holds securely. Furthermore, they will offer great protection as well as comfort. 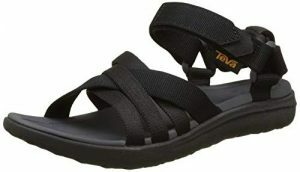 Teva Women’s Sandal is a popular choice among sports lovers. With its water-ready polyester webbing make it extra durable and will dry quickly when it gets wet. As a matter of fact, the sandal is made using 100 percent textile as well as rubber sole that will grip comfortably any kind of surface without sliding. The sandal is likewise lightweight and you can walk for a long distance without getting tired. This shoe features a platform that measures approximately 0.75″ and heel measures approximately 1 inch. It is also properly cushioned for comfort and gripping your leg thus it cannot come out of your legs easily when walking. Ideally, these sandals are versatile great for adventure. 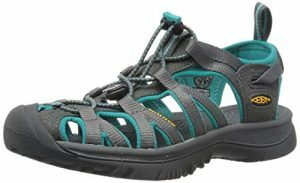 Skechers Reggae-Happy hiking sandals are great for hiking on uneven or slippery terrain thanks to its lightweight sole that enables you to feel and grip the trail. The sandals are made of Synthetic sole and textile or fabric that are durable materials that resist wear and tear. In addition to that, you will never worry about getting wet whenever you are walking through the water as the materials are water resistant and dry quickly. The sandal is well Contoured and cushioned to give much comfort on your foot-bed. Another great advantage of the Sandal design is that orthotic soles are simple to slip inside and will keep in place. 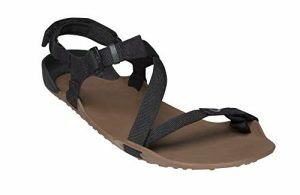 Another great option for a hiking sandal is Northside Burke II. 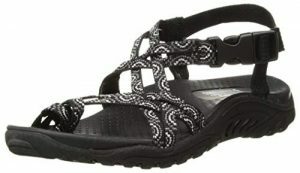 They encourage air flow, whereas the thick heel strap offers more heel and ankle support than other hiking sandals. Similarly, they have Lightweight EVA insole that makes sure that your feet have extra cushioning protecting your whenever you are biking or hiking. This outdoor athletic shoe provides quick drying and water resistant construction and will keep you going all the time. On the other hand, the sandal has a multi-directional rubber outsole that offers reliable traction and grip on both dry and wet surfaces and assists to find your footing. Soft and thin straps adjustable in 3 different places make ECCO Yucatan a fully customizable Women’s Sandal with a dressier look. Multiple adjustments make it have a premium fit. Therefore, the shoes will have excellent support as well as dynamic support from ground effect to-toe-off. Featuring a direct-injected PU midsole foam offer a durable cushioning for everyday trekking comfort. 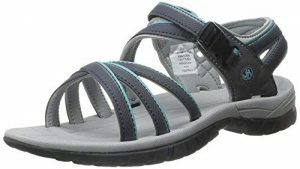 The sandals have a soft microfiber cover that provides superior stability and supreme cushioning. Coupled with molded EVA footbed that is lightweight, you will comfortably walk for a long distance without getting fatigue and will grip the ground with much traction. 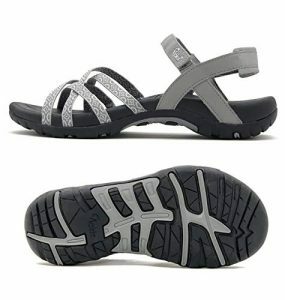 With adjustable heel strap and fully customization triple straps, Keen Whisper Sandal provide a custom fit that you can tighten or loosen to suit your needs. This straps are washable and feature hydrophobic mesh liners that are water resistant. Underfoot, made with ergonomically designed EVA footbed as well as midsole mold that offer enhanced stability. The best sandals for hiking are the one that meets your needs. The best way to get the best one is to read through the reviews and choose the one that will appeal the sense of your budget, style and the correct size. We have provided you with a variety of different styles that are highly recommended for your consideration. We are sure one of the styles on this list will fit your feet.